Phoenix police say the shooting occurred about 11:30 a.m. Sunday near 25th and Van Buren streets. 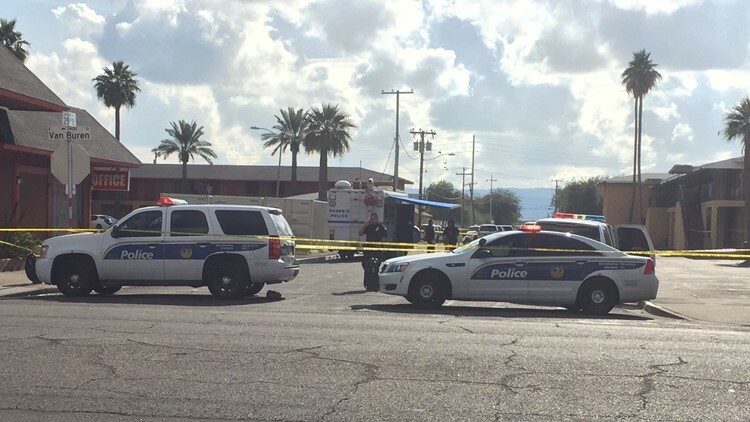 PHOENIX — Authorities say an 18-year-old woman has died and several people are in extremely critical condition following a shooting at a Phoenix motel Sunday. Phoenix police say the shooting occurred around 11:30 a.m. Sunday near 25th and Van Buren streets at the Pay Less Inn. According to Sgt. Armando Carbajal, there were three men and three women who suffered gunshot wounds, including the woman who died. The suspect is also among the injured, police believe. Five of the injured were taken to hospitals by ambulance. Three victims are in "extremely critical condition," according to the police. Carbajal said the victims aged from 18-41 years old. Police believe a verbal altercation turned physical then escalated to a shooting. Police have blocked off 25th Street from Van Buren Street to Adams Street and are actively searching for someone who may have been involved in the shooting. Just before 6 p.m., our own Ryan Cody took photos of police with a woman in handcuffs as officers searched through trash for evidence. Carbajal said there is no threat to the public at the time.